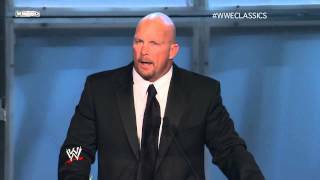 Steve Austin is the largest attraction that the WWE has ever had. He made more money for the company in two years than the previous three combined. He was that red hot. No one can deny Steve Austin’s affect on the wrestling business. He truly is the Father of the Attitude Era. The NWO began the gritty and realistic feel of wrestling. In 1996, when Hulk Hogan turned evil, the game was changed. This was a shock to all wrestling fans and it got over. 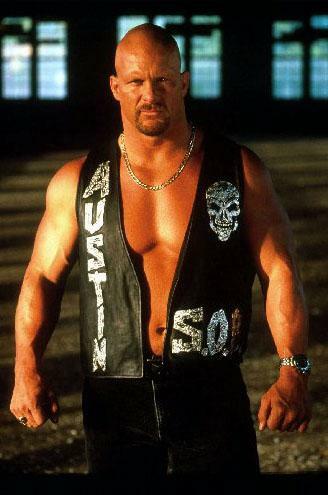 Steve Austin was the WWF’s attempt at the same gritty realness. And he got over as well. After the famous King of the Ring 96 speech, Austin 3:16 signs were everywhere. Austin changed wrestling. He changed the WWE. He made it different than when he orignally came there. Not just different in that a different guy was on top, he defined the era, changed the organization. This has only happened four times in the history of the WWE. Bruno, Hogan, Austin/Rock and Cena. These are the only four (five) who changed wrestling in the WWE and therefore the world. Take a look at the Royal Rumble in 1997 and Steve Austin’s first win. Then compare it to Royal Rumble 1998. The product was different. Completely different. 98 was edgier and grittier. Austin’s popularity after Wrestlemania 13 had sky rocketed. His feud with Vince McMahon had just begun and Austin’s style (plus a little ECW) was everywhere. The Rock was different. Mick Foley was different. They had a sense of realism. This all began with Austin. In 1998 through 1999, no one could touch Steve Austin in terms of popularity. Look at any Stone Cold entrance from that time period, and the pops are the biggest in history. Austin was also the first superstar with sing along catch phrases ( Rock perfected it). And that’s the bottom line, Austin 3:16 and hell yeah were successful and popular. But they were new. Bruno and Hogan didn’t have these. They never interacted with the audience that directly. Austin lit the spark for this practice. It is extremely popular today. Above I put Austin/Rock together as the ones who changed wrestling. That is because Austin really wasn’t around that long. And the Rock had a large hand in modifying wrestling thru and beyond the Attitude Era. Austin lit the spark, but the Rock perfected it. Austin was extremely popular through 1999 and then he got injured. He disappeared from television in 2000 and the Rock carried the banner. While doing that, he changed what the ‘attitude change’ that Austin had brought. It became trashier, and even more cartoony. The Austin/ECW style became WWE’ed by the Rock and the machine. And through this prism, WWE is what it is today. In the video at the top, Austin spoke about Austin 3:16 and his catchphrases. He said that the only reason he got over was these phrases. Without them, he even claims he would never had been as big and probably just known as a “good technician” (think Dean Malenko) Part of me believes this was the WWE’s plan. They used Austin and almost immediately went to the Rock as its main attraction. The Rock fought Hogan, The Rock ended the Invasion, and The Rock became the face and eventually the movie star. And all this began when Austin got hurt and disappeared for many months. The WWE replaced Austin (Hogan was never replaced). We tend to forget that Austin did not have a very successful time in WWE after he returned from injury. He was involved barely until Wrestlemania 2001, turned heel, fought WCW, joined WCW, fought Scott Hall at Wrestlemania, refused to job to Lesnar on Raw, “took his ball and went home”, came back and retired. None of that above was the Austin that we really loved from 1998 and 1999. He never really fit in the Rock’s WWE and everyone knew it. Austin himself was extremely hurt and retired gracefully in 2003. He defined an era in wrestling and in really such a short time. His entire stint with the company was 1996-2003 with two large breaks in 2000 and 2002. That’s an impressive resume and an important character. Texas. Steve Austin is from Texas. It is a natural connection. Austin has been retired for six years at the time, although he regularly appeared at special events and Wrestlemanias. For Texas context and because he deserves it, Austin made sense. Sadly, he did get to proside over the Hall of Fame Class who were given time limits. I was live in Houston and Austin’s speech was 10 minutes long. Not enough time for a great speech. Attitude Era stars. Before Stone Cold, no one was inducted who had been wrestling in the late nineties/early 2000s in WWE (Bret Hart left WWE in 97) Michaels, Edge, and Foley have all followed on their merits. WWE realizes it hates all its fans. This entry was posted in -10 out of 10, Class of 2009, WWE Hall of Fame. Bookmark the permalink. ← Is Bruno Sammartino the Most Important Inductee Ever?